French | Get Your Grub On! 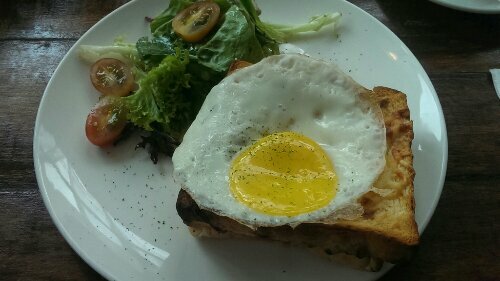 Back here during lunch break I felt light and cheesy and hence ordered their ‘Croque Monsieur‘ for a change. 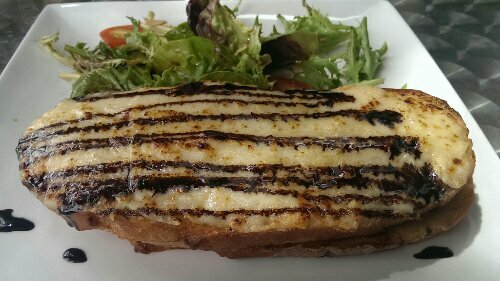 Presentation was nice, two large slices of bread, baked over with loads of cheese and creatively finished with scribblings of balsamic reduction on top. The bread was a bit flappy and the ham could have been thinner sliced but the hearty saltiness of the cheese and the touch of sourness from the balsamic made this a great new lunch option to turn to. Wow, my friend was really super hungry so everything had to be decided rather quickly and be at best around the corner. From the places I had lined up close by most weren’t open so we head over to Jalan Besar to check out ‘Suprette’ in the basement of the Kam Leng Hotel I had read about. 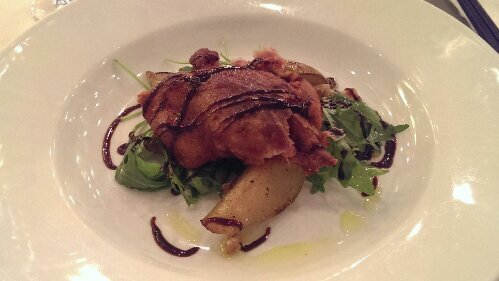 We were greeted warmly by the staff and the interior seemed nice and cosy, something similar to a small bistro. My friend had the ‘Suprette Burger‘ and I ordered the ‘Hanger Steak & Marrow‘ which was the actual reason I had this place on my radar in the first place. When it came to the table it looked pretty tasty, all meaty with a mountain of golden fries. The hanger steak was brilliant, even though cooked slightly over medium and somewhat coldish, it had this rich beef flavor, more rustic and was completely lean which was totally my thing. The fries on the contraty were like hot sticks, crispy and so perfectly salted that I didn’t touch the salt shaker even once for the whole dinner. One thing I missed though was the bone marrow which I thought to remember from pictures of other blogs. I wasn’t quite sure so I asked the staff if it maybe was incorporated into the sauce or something which I didn’t really get a proper answer to and the sauce surely was creamy and delicious but nothing about it really reminded me of buttery marrow. After i had finished up my meal another gentlemen approached us and told me politely that I would now get a two dollars rebate as normally this dish was including half a grilled bone of marrow which they ran out of about a week ago. Usually I would have said something but I wasn’t really in the moment then and actually was quite puzzled realizing I just ate a multilated dish and only was told about it afterwards. Not cool man. At last ‘Suprette’ really is a nice place close to home with some wicked free flow fries and great steak but honestly, this situation could have been handled so much better. I think it’s ridiculous to hold a grudge over something tiny like half a missing bone so when I’ll eventually get over this tragedy in my life I will return here to finally try a flawless and completely intact hanger steak and this time I just buy myself an extra portion of marrow for the two dollars that I saved tonight. 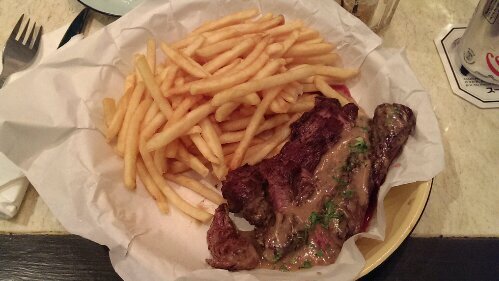 L’Entrecote on Duxton Hill is a french bistro style restaurant that makes it easy for those who can never decide what to order, like me. As main you can have steak, steak or steak, with fries to be exact. So when I feel like something meaty this is the place that I’m drawn to most often. Having only one main on the menu made them become pretty damn good at it. The meat comes usually in two servings – one bigger, one smaller – and is cooked perfectly according to your preference. 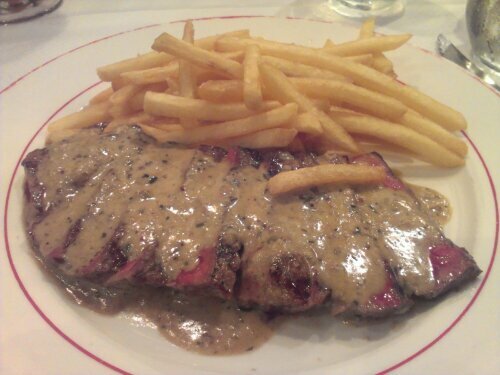 Entrecote is a premium cut from the rib area and at L’Entrecote they cover it with their special creamy mustard sauce which enhances but doesn’t overpower the meat. The fries are thinly cut and crisp and will be refilled as long as you ask for more and together with a small walnut salad all this comes for under 30 dollars ++. 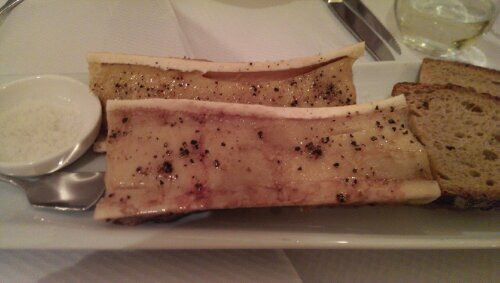 As starters we had the ‘Bone Marrow‘ which comes as one big split and grilled beef bone together with rock salt and toasted bread. 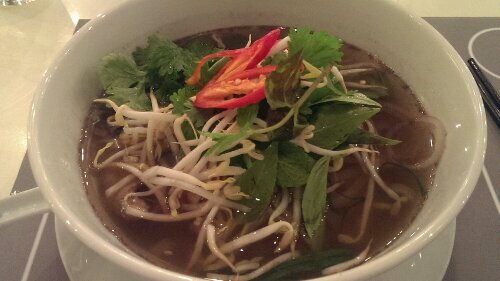 It’s buttery texture and taste make this such a sinful dish but I can’t get around it when I’m there. 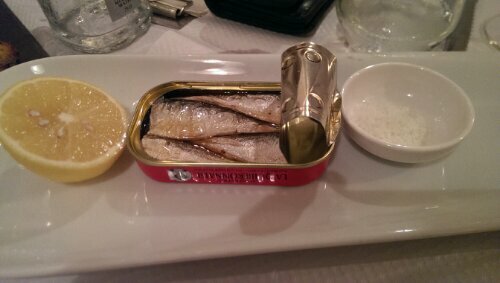 As a second starter we ordered the ‘Sardines in a Tin‘. As the name suggests they are served in an opened tin where the sardines lie in high quality vegetable oil. Spread on a piece of baguette, sprinkled with rock salt and drizzled with some lemon juice this creates a great combination of flavors with the sardines as the headliner. Their house red is a semi dry Bordeaux which is not too heavy and goes along just fine with the food and can also be purchased for takeout. Come early or prepare to wait as they don’t take reservations and it gets very busy in the evenings. 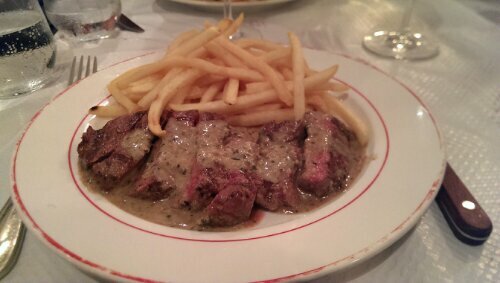 ‘Steak & Fries‘ in perfection.